At St James Episcopal Church , everyone is welcome. Regardless of your age, race, culture, gender, marital status, sexual orientation, your religious background, your disabilities, or your different abilities, you are welcome here. Whether you have money or not, whether you have a degree or not, whether you have a home or not, you are welcome here. St James is committed to being a loving community of faith, built on the foundation of the Good News of Jesus Christ. We pray you will experience healing love and the full welcome of Christ in the time you spend with us. Worship is the central focus of our community. We gather each Sunday to be together in the presence of God. We sing our praise to Christ with hymns and psalms. We call on the Holy Spirit to guide and inspire our lives. We hear and learn from the words of Holy Scripture. We seek a sense of God’s presence praying for ourselves, for our friends and neighbors, and for the world. 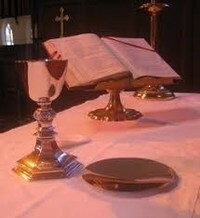 Finally, we are fed with the spiritual food of the Eucharist and sent out ready to do the work of God in the world. We worship in the best traditions of the Episcopal Church. When we design our worship, we strive to bring an abiding sense of God’s presence. You will not find top 40 Christian rock or watered down platitudes here. What you will find is a deep and engaging theology expressed in words that are both beautiful and thought-provoking. Our liturgy has its roots in the worship of the ancient church, but has grown up to still have meaning to Christians in the 21st century. During the service, you can refer to the worship bulletin that is specific for today's service, the Book of Common Prayer (BCP – red color) that contains prayers and readings, and the Hymnal (Blue) for the sung hymns. The first half of the service is devoted to hearing and reflecting on the words of Holy Scripture. Every service contains four readings from different parts of the Bible. We use the readings from the Revised Common Lectionary. Following the readings, the sermon (or homily) is a chance to connect the words of scripture to our contemporary lives. We strive to make our sermons concise, thought-provoking, and accessible. The second half of our service centers on the sacrament of Holy Communion. Each Sunday we are fed with the spiritual food of Christ’s Body and Blood. For Episcopalians this the central focus of our worship together. At St James we believe that it is Christ who invites us to share in his body and blood, and that all are welcome at Christ’s table. The Celebration continues after the service with coffee hour. Please plan to stay after worship for a few minutes for coffee, tea, and goodies. This is our chance to get to know you and for you to get to know us. We place a high value on worshiping together in community and coffee hour is a chance to strengthen our community and say hello to one another. If you are new it is also a chance to meet us in a relaxed casual atmosphere and to talk to others about our church. Please join us even if just for a few minutes.